This is the time of year for bicycles to be taken out of bike storage and prepared to ride through the many amazing bike trails in the Atlanta, Georgia area. Featured below are four bike riding destinations in Atlanta that many cyclists will be exploring this summer. 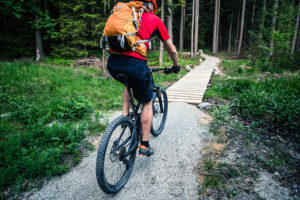 The four Atlanta bike trails of focus for today are Silver Comet Trail, Big Creek Greenway, Stone Mountain PATH and Suwanee Greenway. The Sliver Comet Trail begins at the intersection of South Cobb Drive and the East-West Connector in Smyrna, Georgia and runs all the way to the Alabama border. There, it meets the Chief Ladiga trail in Alabama. A former rail line, the trail runs more than 60 miles through Atlanta forest, farmland, ravines and more before extending into Alabama. It features a gentle grade and scenic views all along the way and is a great destination for bike riding in Atlanta. The Big Creek Greenway is a flat, winding trail with plenty of shade and is divided into two sections. The southern portion (Roswell/Alpharetta section) runs parallel to North Point Parkway. The northern portion, which begins north of Webb bridge, extends south 8.6 miles to a parking lot at Big Creek Park off Old Alabama Road near Holcomb Bridge Road in Fulton County. It is one of the best bike paths Atlanta offers, and with YMCA facilities along the way it can be a great pick for the whole family. The Stone Mountain Trail begins with the John Portman Cycle Track at Centennial Olympic Park. Then, this Atlanta bike trail continues across Piedmont Ave in downtown Atlanta, along the Freedom Parkway trail and ends at the loop around Stone Mountain. The 19-mile-long trail does require on-street travel for almost four miles, in Candler Park and through Clarkston. The trail connects downtown Atlanta to the Martin Luther King, Jr., Historic site, the Carter Center, Fernbank History Center, downtown Decatur, Stone Mountain Village, and Stone Mountain Memorial Park. The multi-use Suwanee Creek Greenway offers a great bike riding experience in Atlanta. This bike path extends four miles along Suwanee Creek through forest and wetlands, with bike paths offering mostly solid surface for cyclists throughout. The greenway connects 400 acres of parkland with residential and commercial areas. Bike Riders in Atlanta can begin this trail at George Pierce Park on the northern end of Suwanee Creek Park at the southern end and pass through Martin Farm Park. Storage World is a self-storage company with storage locations throughout the Atlanta, GA area. We are ready to meet any of your bike storage, household or business storage needs! Visit your nearest Storage World location today or contact us for more information.